Initial results from a London pilot scheme where addicts inject themselves with heroin in a clinic suggest it has reduced drug use and crime. Clinics in Brighton and Darlington also form part of the trial. The injecting clinics, intended for hardened heroin addicts for whom conventional treatment has failed, have operated for about two years. The scheme, which has so far cost £2.5m, is funded by both the Home Office and the Department of Health. During the trial, a third of addicts are using heroin substitute methadone orally and a third will inject methadone under supervision. The remaining third, observed by nurses, are injecting themselves with diamorphine - unadulterated heroin - imported from Switzerland and provided by the clinic. Some 150 users will take part in the trial overall. Final results will not be known for another year but, in London, doctors and nursing staff say drug use has fallen significantly. They also say the lives of those on the scheme have stabilised because they are not buying from street dealers and getting involved in crime. Trial leader Professor John Strang, of the National Addiction Centre, based at London's Institute of Psychiatry, told BBC News that about 40% of users had "quit their involvement with the street scene completely". "Of those who have continued, which obviously is a disappointment, it goes down from every day to about four days per month," he added. "Their crimes, for example, have gone from 40 a month to perhaps four crimes per month. "The reduction in crime is not perfect but is a great deal better for them and crucially a great deal better for society." People on the trial also attend regular counselling sessions and regular appointments with their GP. 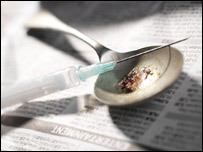 BBC correspondent Danny Shaw said initial results suggested the experiment was having a profound effect on hardened heroin addicts. Many were leading much more stable lives and were enjoying better family relationships because they were no longer in and out of prison, our correspondent added. He said that, although these were very early days, there had been a dramatic effect on the lives of people for whom heroin had been a daily part of their lives for 20 or 30 years. The cost of the treatment, including providing heroin, is between £9,000 and £15,000 per patient - about three times as much as a year's course of methadone. Last year, Howard Roberts, the deputy chief constable of Nottinghamshire, said heroin should be prescribed to drug addicts to curb crime. And earlier this year the number of people treated for heroin addiction in Scotland reached record levels, with about 21,000 people said to be using heroin substitute methadone - 10% more than previously thought. Similar heroin injection schemes in Holland and Switzerland have reported some users turning away from crime.